American persimmons are generally found fruiting at an elevation between 700 and 2700 feet. They seem to prefer well drained soil, but are also found near creeks. These opportunistic trees do grow in forests, but they yield much more fruit when grown in the open. During the autumn, just after the leaves have fallen, while driving down country roads, keep your eyes open! American persimmons are the distinctively delicate trees between 10 and 30 feet tall with bright orangey-pink fruit the size of a golf-ball. They really make a beautiful show during a season when things are looking quite drab. American persimmons are dioecious, which is a botany term that means the trees are either male or female (rather than male and female flowers on the same tree). Wild Abundance director Natalie Bogwalker learned this by observing the trees on her property. She found one particularly large and beautiful specimen, but never saw it bare fruit. Nonetheless, there were a bevy of baby persimmons growing around it, so she figured it must be their mother. After 3 years of watching the large persimmon and finding nary a fruit, she grew suspicious. 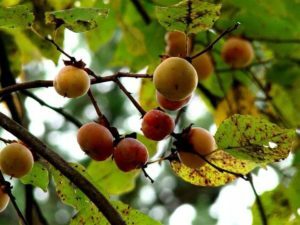 During this time she also noticed a much smaller American persimmon tree on her neighbor’s property that was loaded with fruit every fall. Hmm. So, Natalie did some research. 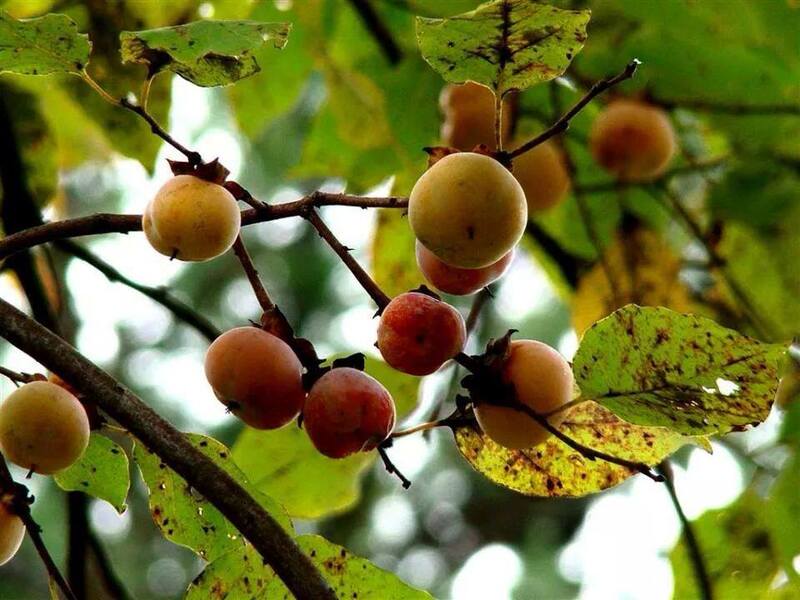 She learned that persimmons spread from root suckers as well as from seed; good information for the garden journal, and to guide management strategies into the future. Another name for the American persimmon is “sugar plum” (ever heard of the sugar plum fairy?). This name is very indicative of the qualities of the American persimmon. In fact, they are shockingly and wonderfully sweet, plus they’re about the size of a plum. As a result, eating just a few fruits can cause a sugar rush and a tingle to any sweet tooth. American persimmons are only edible when they look like they’re about to go rotten: the skin will be very wrinkled, and the fruit itself will appear quite mushy. Furthermore, the color will be a bright orangey-pink. If you try to eat the fruit before it’s ripe, you’ll have a quite memorable experience. Unripe American persimmons (like their Asian cousins) are quite astringent, enough to make your mouth pucker quite uncomfortably. You won’t find American persimmons in stores because they’re difficult to transport and do not keep well. Asian persimmons can usually be found in grocery stores and farmer’s markets in the fall. This is because the fruits are larger and have a longer shelf life. 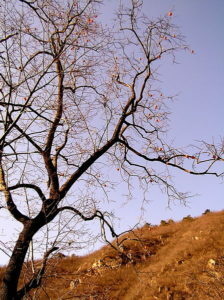 American persimmon trees are a bit hardier than their Asian cousins, which may not survive winters at higher elevations. American persimmon wood is dense and beautiful. It is, after all, in the ebony family. 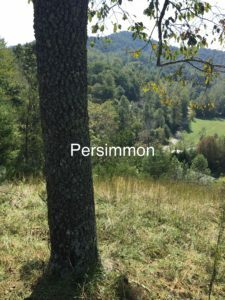 Persimmon lumber, however, does not have significant commercial value because the trees do not tend to grow very big or very straight. Nonetheless, it does make lovely hand-carved spoons, spatulas, and knife handles. Grab branches and shake, or get up in the tree and shake with your whole body. If the tree is ready, there will be a great avalanche of sweet fruit. Make sure not to look up when you shake, as you might end up with fruit, leaves, or little wood particles in your eyes. Gather freshly-fallen fruits in a bucket. Never use bags to gather persimmons, as the fruit is so darned mushy that it makes a big mess when squished up in a bag. Optional: put sheets, drop cloths, or tarps on the ground under the tree before shaking. It’s best to stay away from old tarps, as the paint and plastic can be apt to stick to the fruit, rendering it inedible…and isn’t this the whole point…to obtain the edible? Natalie never ever recommends cooking American persimmons. That’s because what she loves about persimmons is the delightfully smooth texture, and unique sweetness. Indeed, when they’re cooked, this texture turns boring, and the sweetness dissipates. Many recipe books suggest making a persimmon bread similar to a banana bread, or a cooked persimmon pudding. You can try these if you like, but we encourage you to experiment first with raw preparations that showcase the lovely uniqueness of these autumn treasures. In order to make persimmon paste, run persimmons through a Foley food mill using the plate with the largest size holes. Alternately, ff you don’t have a food mill, pick out all of the seeds from the persimmons by hand and mush up the remaining paste with potato masher or with your hands until its shiny and smooth. Combine all ingredients well in a bowl. Chill. Serve. Enjoy! The pudding can be served on its own or with cookies: either shortbread, snickerdoodles, vanilla wafers, or with what are known as “galletas” in latin food stores. American persimmon pulp can make a great addition to homemade ice cream, especially in combination with sassafras root. Persimmon wine and mead are both awesome! Always sterilize persimmons before adding them to mead to prevent the mead turning to vinegar by some errant bacteria that has already started colonizing the ripe persimmons. To do this: pour almost boiling water over the fruit, then let the fruit and water cool before adding both to your brew bucket. Do not cook the fruit on the stove-top, as this will remove much of the flavor. A general recipe is to use one gallon of ripe persimmons per 5 gallon batch of wine or mead. It’s works well to add the persimmons to the primary fermentation. One or two cinnamon sticks, and a vanilla bean are delightful compliments to any persimmon ferment. Put a cup of whole, ripe, persimmons in a jar, and pour moonshine on top. 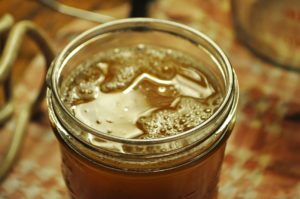 Optionally you can add a cinnamon stick, a vanilla bean, vanilla extract, a bit of wild cherry bark, and/or a quarter cup of evaporated cane juice, panela (the real evaporated cane juice that can be found in cones or cakes in latin food stores), honey, or maple syrup. There are two great ways to dry American persimmons: whole, and as fruit leather. Both are excellent non-electric storage techniques for this highly perishable fresh fruit. 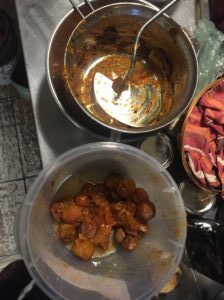 Once, years ago, my old land-mate, James Price, shared some dried persimmons that he had found that had happened to dry on the tree, in a year that happened to have a very dry fall. I found these sweet little treats to be much akin to medjool dates. I love dates, but we can’t grow them in Appalachia, so I was willing to put some energy into figuring out the drying of the whole fruit. When drying persimmons whole I have learned to break all of the rules. I had many bad experiments with trying to dry the ripe fruit. The dried fruit looked fine, but inside the skin the fruit had turned into a somewhat tasteless brown powder. I asked around about this, and someone, I wish that I could remember who, told me that to dry the fruit of a persimmon whole, one must start with unripe fruit. This seemed counter-intuitive to me, but I tried it. I found a persimmon tree with low hanging branches, picked some light orange, but not yet ripe fruit, and put it on the drying racks above my woodstove. After a couple of weeks, the fruit had dried, and ripened as it dried. The result was very similar to the date like treats that I had enjoyed off of a tree years before. In order to make fruit leather with persimmons, make a paste, the same as above in the persimmon pudding recipe. 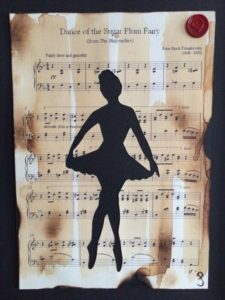 Then, spread it out onto parchment paper, and place it on drying racks above a wood stove, or on fruit leather sheets provided with most electric dehydrators. The flavor of persimmon leather can be a bit sweetly bland. A nice way to add depth to the flavor is to add in crushed Autumn olives, which lend a nice tartness to the finished fruit leather. Conveniently, Autumn olives are harvested at about the same time of year as American persimmons.